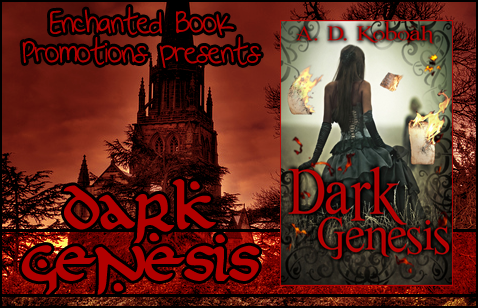 Today I am hosting an excerpt post from Dark Genesis by A. D. Koboah. Read on to find out more about this new book. My name is Luna and my tale begins on a dry summer evening in 1807. I was walking quickly along a dusty country road, my shoes stirring up a small cloud of dust that turned the hem of my faded violet dress a muddy brown. The trail of dust I left in my wake soon settled. But the pressing need that had me make this two-hour journey in beaten shoes and a broken spirit, in the midst of a particularly merciless Mississippi summer, would not be settled as easily. Wiping the sweat from my brow and waving away the flying insects that droned lazily near my face, I wished for some respite from the relentless heat but found none. Although the sun hung low in the topaz blue sky, it felt as if I were walking through warm soup and it was likely to stay like this long after the sun went down. I would have found some relief from the pitiless sun if I had chosen to walk through the woods that rose up on either side of the road like a green and brown wall. But green woody spaces such as those have been a deep source of fear for me since I was a child and I imagined that they would continue to be so long past what I guessed was my twenty-second or twenty-third year on this earth. So I clutched my lantern and small cloth bundle and walked on in the heat, listening to the birdcalls punctuate the otherwise still air. I was lucky to be able to make this journey during the summer months as the previous two trips had been made in the dead of winter when night gathered up the day long before I could finish serving the family’s supper and slip away, leaving the other house slaves to do my share of work and conceal my absence. That small mercy meant that I didn’t have to walk alone in the dark, afraid to light my lamp in case the solitary glow brought unwanted attention my way, or have to dive into the trees every time the sound of a horse’s hooves disturbed the sweet melody of the crickets. It also meant that when I turned the corner and saw the woodland give way to cotton fields, marking the beginning of the Marshall plantation, there was still roughly two hours of daylight left, which meant I would be able to finish my business and be back before dark, hopefully before I was missed by my hawk-eyed mistress. I stopped for a second to gaze at the rows of cotton up ahead. I have always thought that there was something heavenly about cotton fields, which looked like row upon row of fleecy white clouds caught up in brown nets. But I’m sure that the brown-skinned figures bent double between those rows would have disagreed. For them, there was nothing even remotely celestial about the cotton fields in which they had been toiling since sunrise. And they were likely to still be working in them when the sun set. 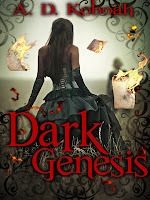 Even from this distance I could see that most of them were wretchedly thin, their few flimsy items of clothing in tatters. And although I wasn’t close enough to see their faces, I was sure that they all wore uniform expressions of misery and fatigue. I just wanted to thank you for featuring my debut novel, Dark Genesis, on your website.